Book your holiday in Tuscany at Ancora del Chianti Country Bed and Breakfast with Art Studio and challange your talent with art course holidays in Italy or just a short art break in Tuscany with watercolour or acrylic painting lessons. 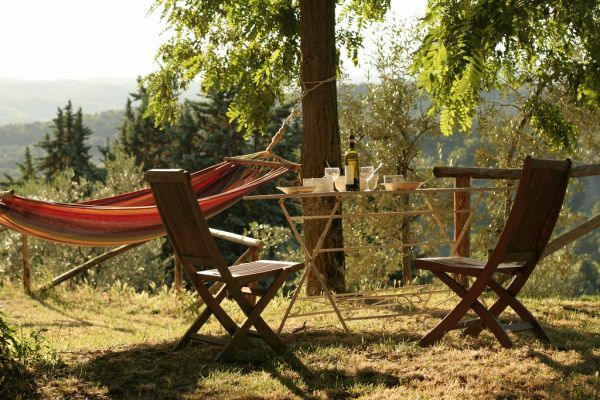 Ancora del Chianti EcoBB & Art Retreat in Tuscany is the perfect location offering accommodation and art courses for an artistic experience while enjoying your holiday in Chianti for couples, solo travellers and groups. It is centrally located between Florence and Siena, in the heart of Chianti, overlooking the valley. The charming village of Greve in Chianti, just 5 km from the farmhouse. The overwhelming beauty of the hills covered by vines and olive groves, mediterreanean vegetation, farmhouses and cypresses as well as the flowered garden will inspire and invite you to paint and draw. 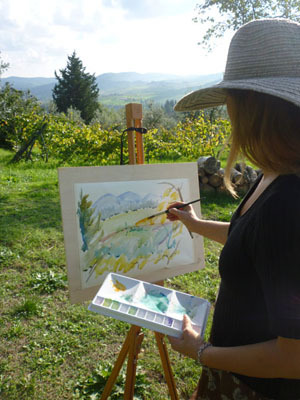 Ancora del Chianti offers 7 days workshops with international masters (see 2019 CALENDAR HERE) and watercolour and acrylic private painting lessons with an enthusiastic and competent local teacher and convenient studio for indoor lessons together with comfortable accommodation in a charming setting. You will be guided by a passionate and experienced teacher in an inspiring and motivating environment. The teacher combines her passion for art and watercolour and acrylic painting with a competent teaching approch in strong connection to nature and the surrounding landscape and will give you tips and advices helping you to improve and develop your personal style and expression. Your class program will be personalized to your needs, existing skills and objectives. You can learn how to draw your subject and compose the painting, about color theory and perspective. You will excercise different watercolour and acrylic techniques, including layering, positive and negative painting, improve your control of water and colour. You will obtain all the necessary knowledge to continue the adventure of painting watercolours on your own once you will be back home. Courses can be can be of half day lesson in the morning or afternoon, full day or a full immersion course of several days and they are suitable for individuals, couples and groups with beginners and/or more experienced students. The program will be arranged according to the level and the expectations of the students. Specific programs for families and small groups. 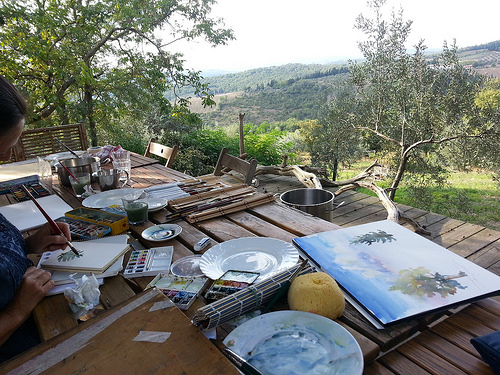 Even just a half-day painting experience in Tuscany will give you a the magic into the wonderful world of painting. One painting at least will be completed. Basic material is provided. More specific art material can be provided on request. 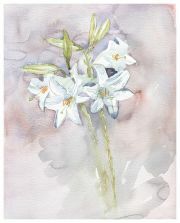 Watercolour Painting Course: from € 60.00 per person for 3 hour lesson and basic art material provided. Acrylic Painting Course: from € 75.00 per person for 4 hour lesson and basic art material provided. ...and your artwork will be the favourite holiday souvenir of Tuscany to take home! The marvellous views and scenic settings of Ancora del Chianti will inspire with endless subjects. 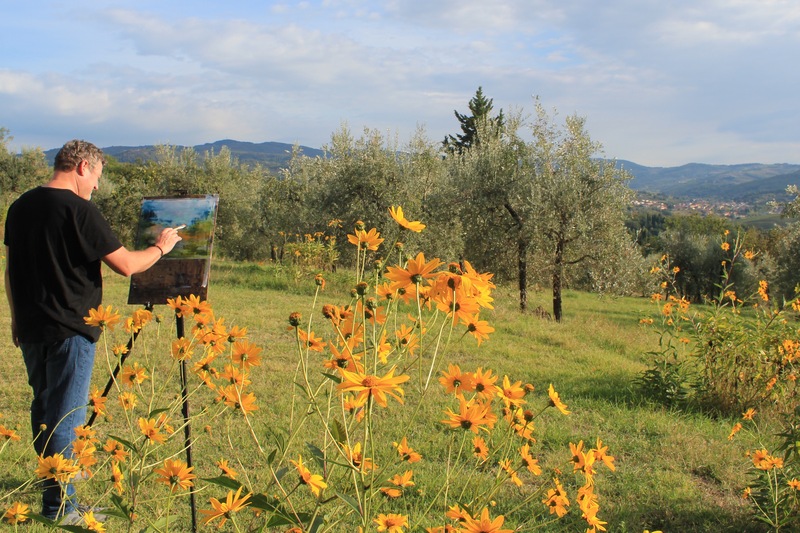 Painting 'en plein air' and enjoying the outdoor location embracing olive groves, wines and the hills of Chianti will certainly be an unforgettable experience. 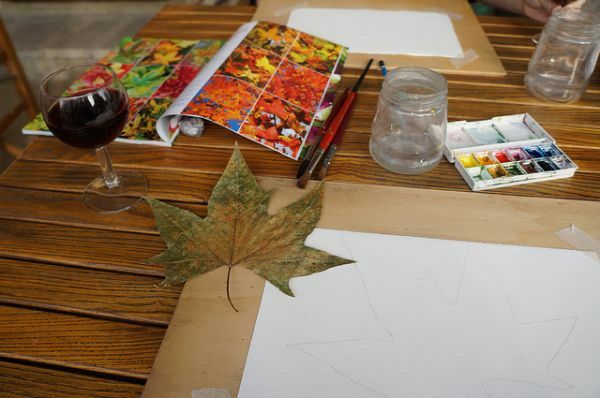 Sketching and drawing, composition and perspective, light and shadow - observing and capturing the Tuscan colours and light during different moments of the day, as well as studies of characteristic elements will be part of the program. You will learn how to build up a watercolour or acrylic painting with layers and achieve deepness and distance to your work ending up with a very personal souvenir of Tuscany. You will be inspired by the beautiful garden and surroundings of Ancora del Chianti B&B with flowers, herbs, trees with colourful foliage and fruits, pots with succulents and much more. Painting surrounded by the fragrance of the seasonal flowering such as roses, honeysuckle and irises as well as herbs like mint, lavender, lemon balm, rosemary is a pleasure for your senses but also a great way to practice and learn more about watercolour and acrylic techniques: acrylic painting is perfect to reproduce the richness and aboundance of nature with vibrant colours; watercolours are fantastic for capturing the levity of flowers and nature, making colours flow with the water and seeing the magic appear. Drawing and painting a still life subject with everyday familiar object and simple natural elements seems an easy task but it is not. The main purposes are understanding the complexity of the composition, simplifying shapes and detecting hues. Inspiring still lives with objects, fruit or natural elements will help to study light and shadow, colour, prospective and composition, positive and negative painting as well as painting the background. This is one of the best way to learn or improve your painting and drawing skills, blending colours, practicing the different techniques of layering. The limited space and the limited number of elements can help to speed up the process. Often you achieve the most when you are just playing with water and colours. The skills you achieve will turn out very useful as part of your future abstract and figurative paintings with a focus on techniques like wet on wet painting and wet on dry painting, positive and negative painting, how to create structures and experiment mixing different alternative materials. Perfect for small groups and for absolute beginners learning the basics of mixing the colors and experimental watercolour techniques. This is also suitable for artists of different skill levels with the aim of a more free painting and wish to go beyond with this media.